1. Sift the flour and cocoa powder in a bowl and add ground hazelnuts and baking powder. Put in another bowl, combine the eggs and sugar and beat it until a thick, frothy mass is obtained. Fold in the flour mixture gently by. Grease a 20cm cake tin with butter and top the bottom with parchment paper. Preheat the oven to 180 ° C.
2. Fill the tin and put the form in the middle of the oven and bake for about 40 minutes. When the cake is baked, let it cool down for a while. 3. Now you can make the chocolate cream. Melt the chocolate au bain marie. Break the waffle biscuits into small pieces and set aside. Mix the butter until creamy and mix nutella and melted chocolate through. Add the waffles. Cut the cake horizontally through the middle. Spread the inside with chocolate cream. Coat the cake with remaining chocolate cream. 4. 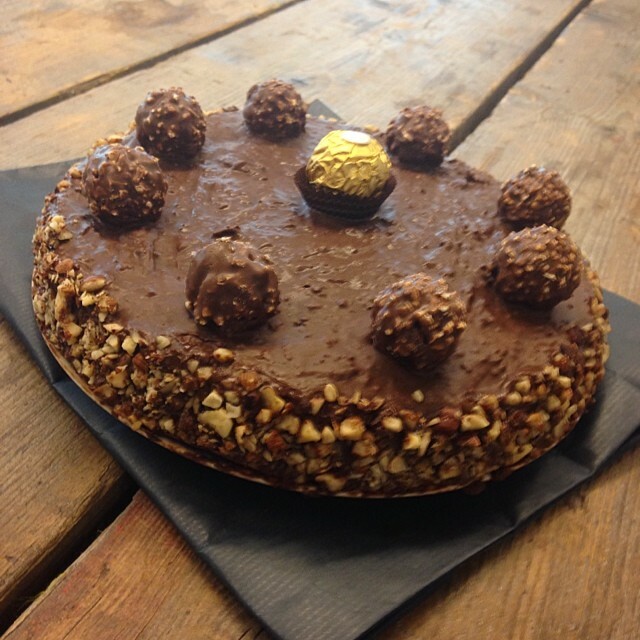 Sprinkle the top with coarsely chopped hazelnuts and decorate cake with Ferrero Rocher chocolates!